The world of grab adhesives can be a confusing one with so many different products available on the market offering a multitude of features and benefits for a wide range of applications. Where historically builders and tradesmen would have used mechanical fixings to attach skirting boards, door frames, shelving etc. 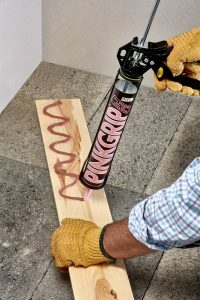 more and more are now choosing to use and trust grab adhesives saving themselves valuable time; something that any tradesperson wishes they had more of. Solvent free or acrylic-based adhesives are predominantly used by the DIY market due to their easy to use, less hazardous properties. Products such as Everbuild Gun A Nail cure through loss of water in the substrate, so must be applied where at least one surface is porous. Solvent free adhesives are ideal for internal applications including bonding architrave, skirting boards and polystyrene coving. However, they can also be used externally but will cure at a much slower rate. Solvent-based adhesives are mainly used by the professional user and dry by evaporation of solvent in the air so, unlike solvent free products, they can be used on two non-porous substrates such as metals and ceramics. 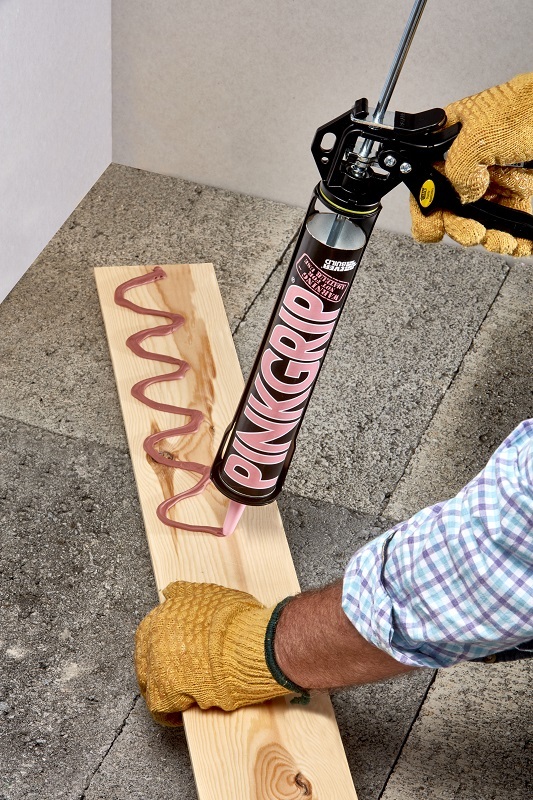 Pinkgrip from Sika Everbuild is a great example of the high strength instant grab that can be obtained from a solvent based adhesive, and thanks to its revolutionary initial ‘Direct Bond’ there is no need to adhere to the double stick method often required with grab adhesives. 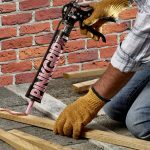 Pinkgrip and many other solvented adhesives also offer gap filling properties to accommodate uneven surfaces and enhanced slum resistance which removes the need to pin under the workpiece. Hybrid polymer technology is the next generation when it comes to grab adhesives, combining the application possibilities of both solvent free and solvent based adhesives with the added advantage of being used as both an adhesive and sealant on wet surfaces and even underwater. Many hybrid polymer based adhesives such as Everbuild’s Stixall Extreme Power can also be used on most porous and non-porous materials including glass, brick, timber and hard plastics plus many more making them the ideal product for use in an almost unlimited number of applications. So now you can get stuck into the world of grab adhesives and choose the right product for your application needs!